Anna in apartment 3 knows all about balance and is as happy as a clam when she’s on two wheels. 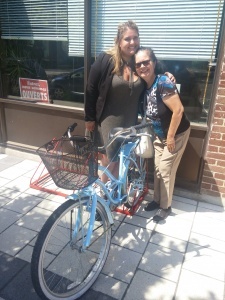 She was so thrilled when Our Harbour summer student Hayley gave her a bike. For two months this summer, she would go off cycling to work or for pleasure almost every day. Horror of horrors, recently she went to the fence behind the apartment where she had locked her vehicle only to find it had been stolen! So, for a while she had to resort to walking, which she enjoys and actually practices for at least an hour every day. But then she learned that an antique dealer in Ville Lemoyne (Joey Vine of Quinn Antiques. Many thanks, Mr. Vine!!) sold second-hand bikes for a reasonable price. She was lucky enough to pick one that actually looks brand new. It now goes upstairs with her after an outing and she keeps it locked even inside her room. She isn’t taking any more chances! Speaking of balance, this is what characterizes Anna’s current lifestyle. She has put her training in office administration to good use and found part-time work at a local call centre. To offset the sedentary nature of her job she cycles or walks to work “for my health”, she emphasizes. But not content with that, she has also found a niche as volunteer in a shelter for women and children who have experienced conjugal violence. It is mostly office work, but she does see the women occasionally and hears snippets of their experiences. Anna says that she is very happy at Our Harbour. She appreciates the peacefulness, never feels lonely, and gets on well with the other residents. The Our Harbour community has given Anna a new family, a sense of belonging and a profound feeling of gratitude. For Anna is totally alone in life, with no family members apart from a lost sister 15 years older, who is evidently living with her own problems. For sure, we will keep up the good work of helping Anna and all our other residents, but we need all the support you, dear reader, can offer in the form of a donation or as a volunteer. This year, our Board has set an ambitious goal: to raise $12,000 by the end of the 2017 fiscal year.